Ronald Harold Nessen (born May 25, 1934) is an American government official who served as the thirteenth White House Press Secretary for President Gerald Ford from 1974 to 1977. He replaced Jerald terHorst, who resigned in the wake of President Ford's pardon of former president Richard Nixon. Prior to joining the Ford administration, Nessen served as a Washington, D.C. correspondent for NBC News. On the day of Ford's succession to the presidency, August 9, 1974, he provided commentary. That evening he was on the NBC Nightly News; in that piece, Nessen reported on the appointment of terHorst, the man whom he himself would succeed one month later. Nessen, who also served NBC News as a war correspondent during the Vietnam War, was seriously wounded by grenade fragments while on patrol outside Pleiku in the Central Highlands in July 1966. He was with cameraman Peter Boultwood when he was wounded. 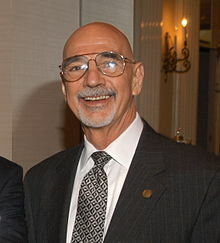 He was a member of the Peabody Awards Board of Jurors from 1996 to 2003, and served as Chair in 2003. "Nobody believes the official spokesman but everybody trusts an unidentified source." On April 17, 1976, Nessen was the first political figure to host Saturday Night Live. His episode is also known for having Gerald Ford open the show with the "Live from New York, it's Saturday night!" tagline. On a previous episode, Ron Nessen had been portrayed by Buck Henry. ^ Steinman, Ron, Inside Television's First War: A Saigon Journal (University of Missouri Press, 2002), via books.google.com. Retrieved 2016-01-14. ^ a b "NBC's Ron Nessen wounded while on patrol with Charlie Company of 101st Airborne", nbcuniversalarchives.com. Retrieved 2015-08-06. ^ "July 1, 1996 – June 30, 1997 ... July 1, 2003 – June 30, 2004 Peabody Board Members", peabodyawards.com. Retrieved 2016-01-14. ^ "Saturday Night Live Season 1 Episode 17: Ron Nessen ...", tv.com. Retrieved 2016-01-14. Wikimedia Commons has media related to Ron Nessen. This page was last edited on 17 February 2019, at 14:05 (UTC).